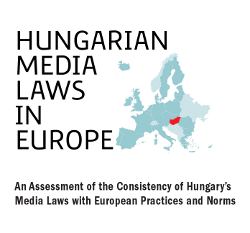 Publications of van Beek, J.
Brouillette A, van Beek J. Hungarian Media Laws in Europe: An Assessment of the Consistency of Hungary’s Media Laws with European Practices and Norms. Budapest: Center for Media and Communication Studies (CMCS); 2012. This study addresses a key international policy debate regarding the conformity of Hungary’s new media legislation to European media-regulation practices and standards. It presents expert analyses of the 56 media regulations from 20 European and EU-member states that were cited by the Hungarian government as precedents for its new media laws. The study finds that Hungary’s media laws are largely inconsistent with the cited European practices and norms. In a majority of examples, experts report that the Hungarian Government’s references omit or inaccurately characterise relevant factors of the other countries’ regulatory systems, and as a result, the examples do not provide sufficient and/or equivalent comparisons to Hungary’s media regulation system. The study also reveals a wide disparity in media-regulation policies among European and EU-member states and highlights some key deficiencies in a number of other European systems that may inhibit press freedom. Coyer K, van Beek J. Community Radio in Bosnia and Herzegovina: Opportunities and Challenges. In: Communication and Community: Citizens, Media and Local Governance in Bosnia and Herzegovina. Sarajevo: MEDIACENTAR Sarajevo and Center for Social Research Analitika; 2010. p. 123-77.
van Beek J. The issue of net neutrality takes a sharp turn . ; 2010. Proponents of net neutrality in the Internet content industry and among public interest NGOs have long been sparring with opponents of the principle in the telecom industry, and both have pushed hard to influence slow-moving political processes in the EU and the US. In August 2010, however, the status quo was roiled by striking new developments in the US, primarily by a joint proposal by Google and telecom giant Verizon. This review for the CMCS summarizes the Google/Verizon plan, the substance of the various responses and critiques of the proposal, and the FCC response. The 21-page review traces the backstory of developments around net neutrality in the US that led to this point, and includes a primer on what net neutrality is. It also includes a list of relevant links and information on experts, advocates and reporters cited in the review.